Like other iPods, the iPod touch is perfect for podcasts. 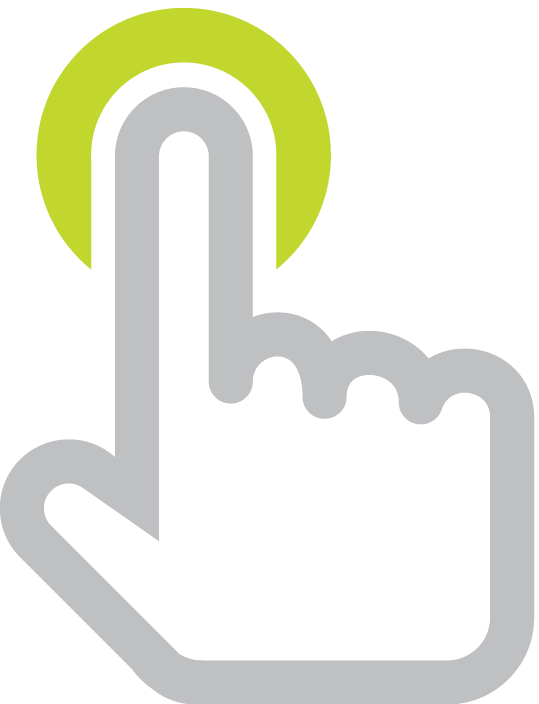 Just like click-wheel iPods, the podcasts you have subscribed to in iTunes on your Windows or Macintosh computer are automatically transferred to the touch when synced. If a podcast has artwork, it is displayed on the large screen. Video podcasts look awesome on an iPod touch because of that large screen. Something that I don't like is that all audio synced from iTunes is found in the Music app--even if the audio is not actually music. That means you have to tap the Music icon to access podcasts. By the way, video podcasts are found in both the Music and Videos apps. 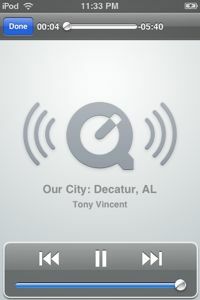 Unlike click-wheel iPods, you can download podcast episodes on an iPod touch without syncing. You'll just need a Wi-Fi internet connection. When in the Music app under Podcasts, tap a podcast to see its episode listing. At the bottom of the screen you'll notice Get More Episodes. 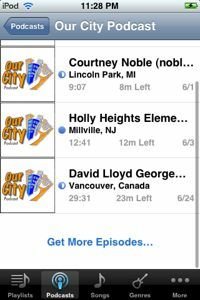 Tap that and the mobile iTunes app on the touch will launch and take you to the complete episode listing for that podcast. 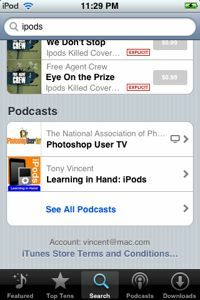 In iTunes, tapping the Free button downloads that episode onto your iPod. Once the download is complete, the episode appears in the Music app, listed with the other episodes of the podcast. Unfortunately, if a podcast is not listed publicly in the online iTunes Store directory, then its episodes will not appear in mobile iTunes either. 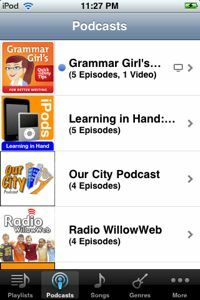 The podcasts section of mobile iTunes is no where near as extensive as that of desktop iTunes, but you can drill down to specific categories. 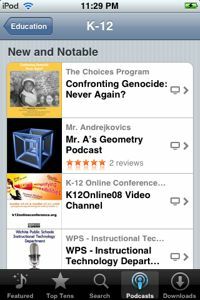 For example, you can get to my favorite category: Education > K-12. The mobile directory is certainly not a complete listing, however doing a search for podcast titles will reveal the podcasts you're looking for. The search seems pretty limited and does not search for individual episode topics--only podcast titles and keywords. As an alternative to downloading an episode (which is saved in the Music app), you can stream episodes in the iTunes app. Streaming does not display an episode's artwork and you cannot access an episodes lyrics/notes, but streaming can be handy if you don't want to wait for the episode to download completely. Besides not showing artwork, a problem with streaming is that the audio or video may have to pause for buffering and if you exit the iTunes app, then the playback stops and what's been streamed is not saved. You cannot subscribe to podcasts, only download individual episodes. You cannot input a podcast's RSS feed--a podcast must be submitted to the iTunes Store and approved for it to be listed. iPhones using the cellular network cannot download episode files larger than 10MB. Almost all episodes are larger than 10MB. Oftentimes movie files listed in mobile iTunes cannot be played on the iPod touch and you're given the warning, "This movie could not be downloaded." All that great content in iTunes U is not listed. The whole process of downloading an episode in mobile iTunes seems clunky. I'm guessing Apple will improve this feature in future software updates. Having the ability to download podcast episodes right there on the iPod touch is a useful feature. Busy educators often don't have time to sync their iPods. With a classroom set of iPods, syncing often is logistically be difficult. When students bring their personal iPods to school, it's not a good idea for them to sync with school computers. So, it was a smart move for Apple to include podcasts in mobile iTunes as a way to get educational content on an iPod touch without the hassle of syncing with a desktop computer. Tomorrow's 12 Days of iPod touch is about voice recording--recordings that could be used for a podcast.